The initial eight quartet tracks on this disc comprise the original release issued by Epic Records in 1961. Subsequently re-issued by Koch on CD with an additional alternative take it now re-appears in this latest manifestation with a further two quartet tracks and two tracks featuring Coles as a soloist within a septet under the leadership of tenor sax player Eddie Chamblee. 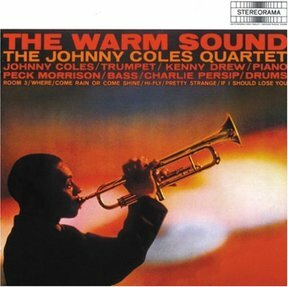 Recorded over two sessions the original disc represented Coles’ debut as a leader and given the paucity of releases made under his name (I believe there were only four) it is good that that it has found its way back into the catalogue .Though it is not as highly regarded as the session he recorded for Blue Note under the title `Little Johnny C` it is a very worthwhile acquisition being a career landmark and a very pleasing example of the hard bop scene of the time. For many fans, Coles name came into focus through his work with Gil Evans starting in the late fifties when he made his mark as a featured soloist in the Pacific Jazz release `Great Jazz Standards` and subsequently, Old Bottles, New Wine`. His playing on `Davenport Blues`, to be found on the former, finds him possessed of a distinctive tone which emerges evocatively from Evans’ hazy orchestrations. His exposure on these discs no doubt set him up for this debut but for some reason or other he didn’t emerge from it with star status but mainly stayed within the ranks making fine contributions to other people’s recordings. Much is made of his sound –hence the title- and it does have distinguishing characteristics that mark him out from run of the mill hard bop trumpeters. If I were to describe in oenological terms I would say it was smooth and dry with a fruity depth in the finish. Stylistically he is a lyricist, economical in his phrasing, staying in the middle range but occasional making flights into the higher register and interspersing his legato progressions with staccato flourishes as mood and tempo dictate. The set commences on a sprightly note with a bright fanfare statement before launching into his one original , a minor blues called `Room 3` which showcases all the virtues of his top notch band with an especially stimulating solo from Drew. To follow there are a couple of songbook standards and originals from the pen of Randy Weston including two takes of `Hi-Fly`. Weston plays on neither of these but can be heard as an accompanist on his sombre ballad `Where` and he contributes a gloriously funky solo to his infectiously engaging `Babes Blues`. Notable amongst the bonus tracks is a ballad lifted from a Duke Pearson session which Coles invests with the pathos and solemnity typical of a Stephen Foster lament and to finish, though not in the order printed on the sleeve, we have the septet items, a fine version of Golson’s timeless classic, `Whisper Not` and a rollicking piece of mainstream joyousness entitled `Chamblee Special`. Coles carries the melody line of the Golson piece with just the right degree of finesse and restraint essential to a perfect realisation of this signature piece.